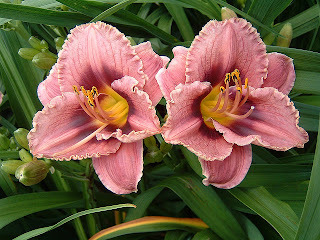 If you think all day lilies are all the same you’re not alone. They seem to just come up in the spring, bloom in summer and then are over for the year. Or are they? 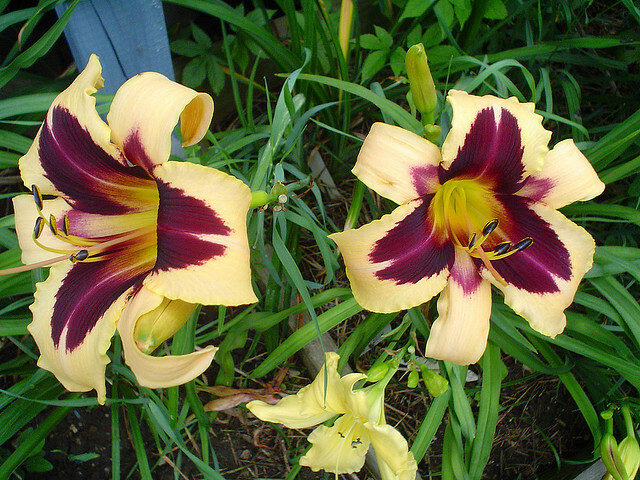 In fact, day lilies fall into two distinct categories: diplod and tetraplid. Why the distinction? It’s all due to human fiddling with mother nature. Just like every other living thing, plants have a specific set of chromosomes. 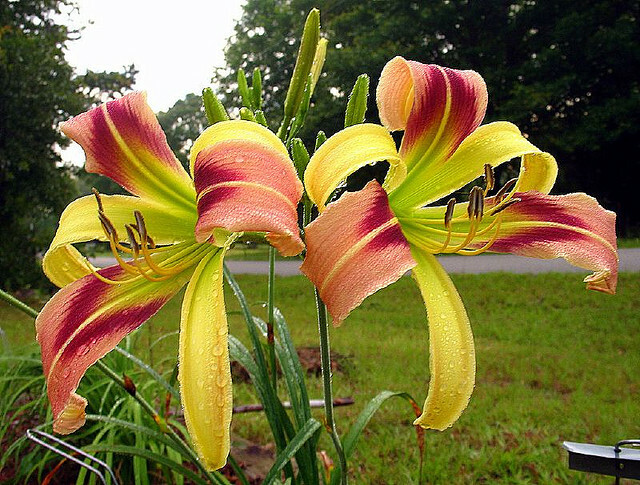 Most day lilies are diploid, meaning that they have two sets of chromosomes (one set of 11 from each parent for 22 total) in each cell. Because of selective breeding, we have created tetraploid day lilies. Each cell has 44 chromosomes. This is not to say that one is better than the other, or that the originals have no place in your garden. Each has their distinct advantages. 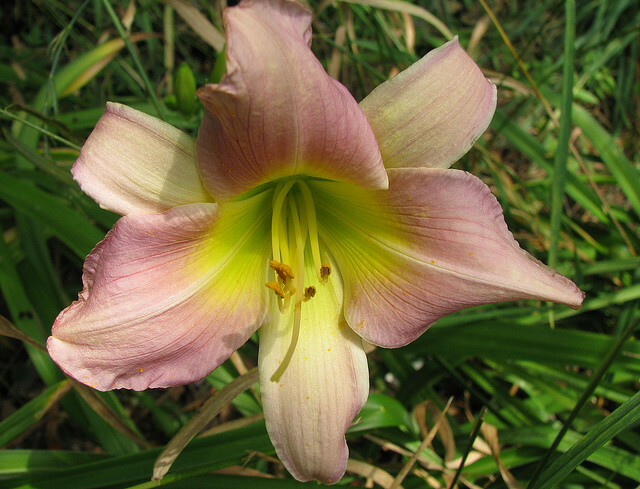 The overall plant of a tetraploid day lily tends to be more substantial. This is borne out by larger flowers, sturdier stems and more substantial leaves. Because of the extra chromosomes some hybridizers also feel that they have greater breeding possibilities. Although more delicate than their larger siblings, there are some colours and forms that are difficult to achieve in tetraploids. For example, pink, spider and double flowers are more prevalent in diploid lilies. They also seem to be easier to cross breed than tetraploids. 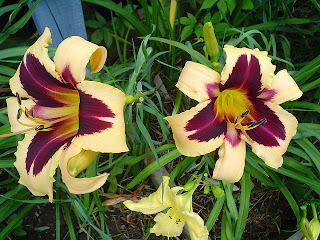 Varieties of day lilies are nearly too numerous to count and many are so similar that identification in a garden can be uncertain. Hemercallis fulva is the “original” old orange day lily and has naturalized in wide areas of North America. It is extremely hardy and can stand transplanting at just about any time of the year. I have tried and succeeded in Spring, Summer and Autumn. 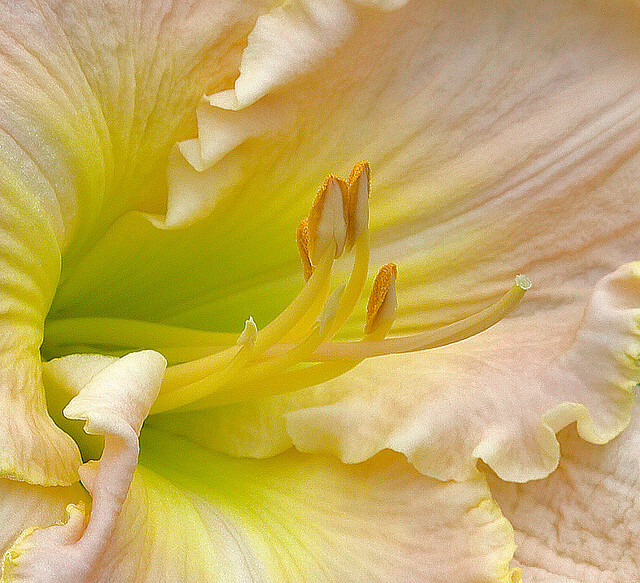 There are many reblooming and ever blooming day lilies available for purchase in an astonishing array of colours. Reblooming means that the plant usually blooms in Spring and then repeats in the Fall. 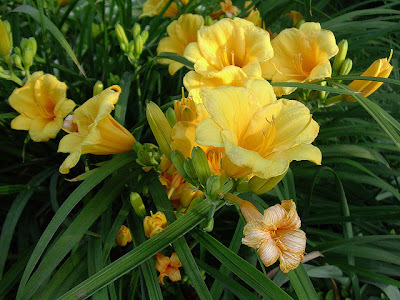 A quite common ever blooming day lily is Stella d’Oro which is a shorter variety that seems to be a favourite of city gardeners. I’m assuming because of its hardiness and small garden footprint. Usually once it starts blooming it is non-stop until killed by frost. There is very little break between flowering, if any. Day lilies are hardy from USDA Zone 3 through 10 depending on variety, so nearly all of us should be able to find some of these beautiful, reliable plants to grace our gardens.